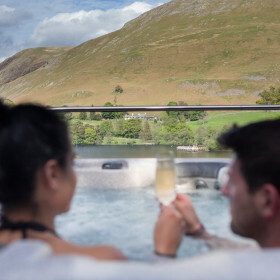 At The Ullswater Estate, special is a very specific feeling. 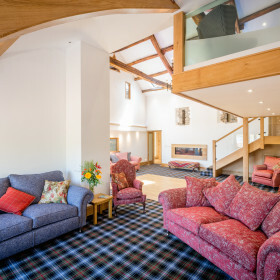 It’s the sense of exclusivity for 20 in Ullswater House and Ullswater Barn. That feeling you get when outstanding opulence meets natural grandeur, on Ullswater’s shoreline beneath soaring peaks. It’s the iconic joy of a private cinema, spa and infinity-terrace hot tub. The lake steamers cruise on by. The fells rise majestically from the water’s edge. 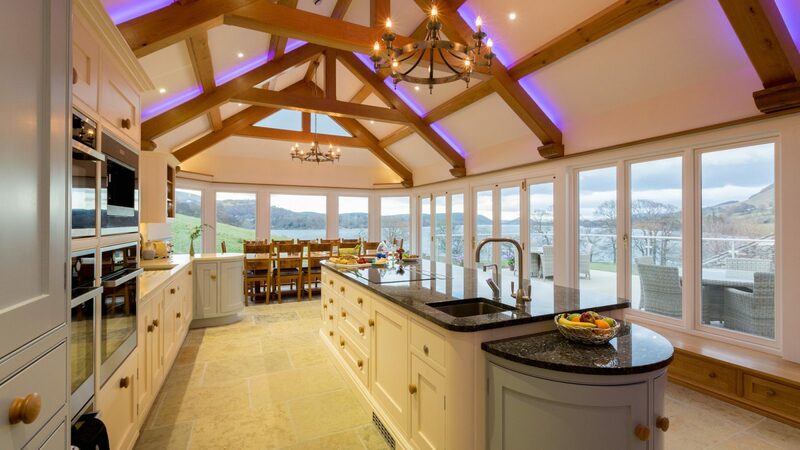 The expanses of glass invite the views in. 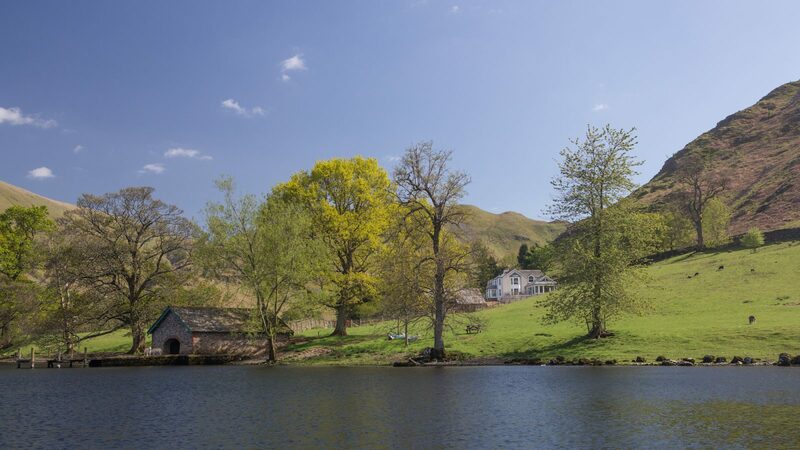 The Ullswater Estate is a sumptuous and serene 26-acre slice of English Lakeland comprising Ullswater House and Ullswater Barn. 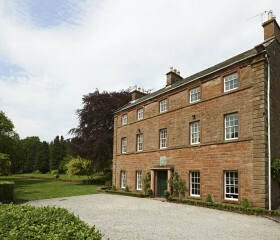 Book the whole pheasant-shoot and exclusive use for 20 will be yours. 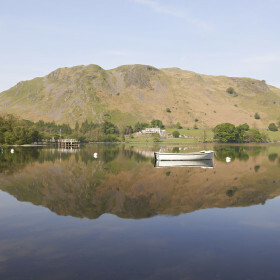 Walk the Ullswater shore – you’ve got half a mile of it all to yourself. Skim stones, clear your head, let your dog run wild. Take a book out to the jetty by the boathouse. 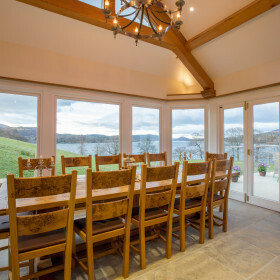 In Cumbria, the outdoors is grand and invigorating, beneath big skies and soaring peaks, but the outstanding opulence of Ullswater Estate will invite you in. You’ll be drawn by the modern oak beams, the glass balustrades and the vast kitchen opening out onto the lake-view infinity terrace. You’ll love the Villeroy & Boch bathrooms, the iPad technology and the sumptuous bedrooms. 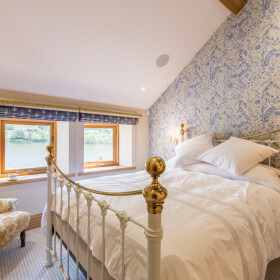 Drift off to the lapping of the lake water, cosseted by duck-down pillows and Vi-Spring mattresses. More iconically, you’ll enjoy the private cinema with mood lighting and Sky TV. After the credits have rolled, rock on down to the Spa and Wellness Sanctuary. 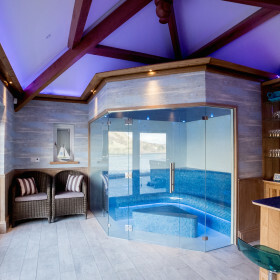 Grab a G&T from the bar and soak up the silence in the terrace hot tub. If there’s a more spectacular self-catering break in the Lake District, it must be very special indeed. 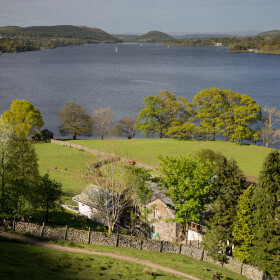 The English Lakes is a giant garden in itself, with the kind of rockeries and water features that no garden centre can supply. 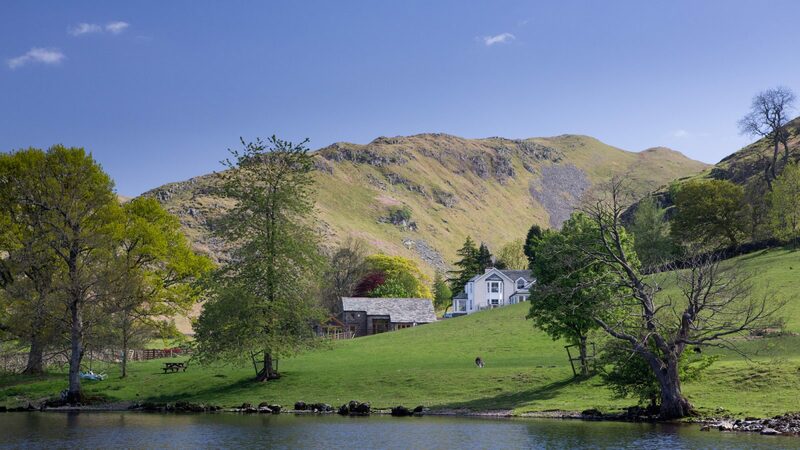 You’ll have gazed in awe and wonder as you made your way to Ullswater Estate, past fells and falls cascading into mirror lakes. 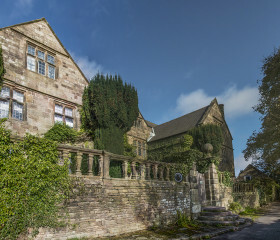 The sense of grandeur only grows on arrival, as you sweep up the driveway through Ullswater Estate’s 26 acres, past Ullswater’s chugging steamers. Want to arrive in style? Talk to us about helicopter or yacht access. There’s space here to feel free as a bird. 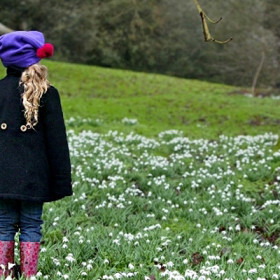 Wander the half-mile of Ullswater shoreline. Walk the fells, set sail over the lake, or just chill by the boathouse on the jetty with a book and a Beaujolais. There are spaces here to get gregarious with your loved ones and spaces to escape. The drawing room does that job nicely. 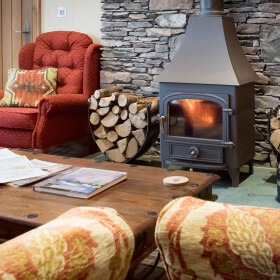 Light the logs and curl up with a classic or train the telescope on the fells or falcons. Change the scene in the mezzanine, with the happy vista of grazing sheep and lapping waters. Move up to a movietastic experience in the iPad-controlled private cinema. 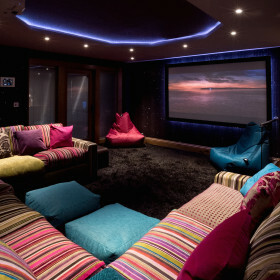 Set the mood lighting, break out the popcorn and unwind on the squishy sofas in front of the huge screen. Sky Movies and Sky Sports sit alongside the integrated music system, Bluetooth and wifi. This is a technological treat. 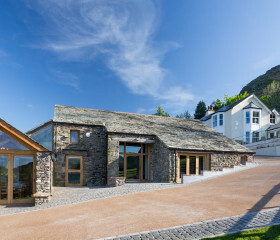 In Ullswater Barn, the Lake Room triples as cinema, dance floor and games room. 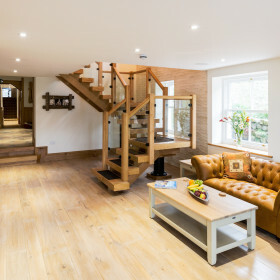 Gather with the people who matter beneath the modern oak beams and glass balustrades. Pour the drinks, settle back and rev up the remote. 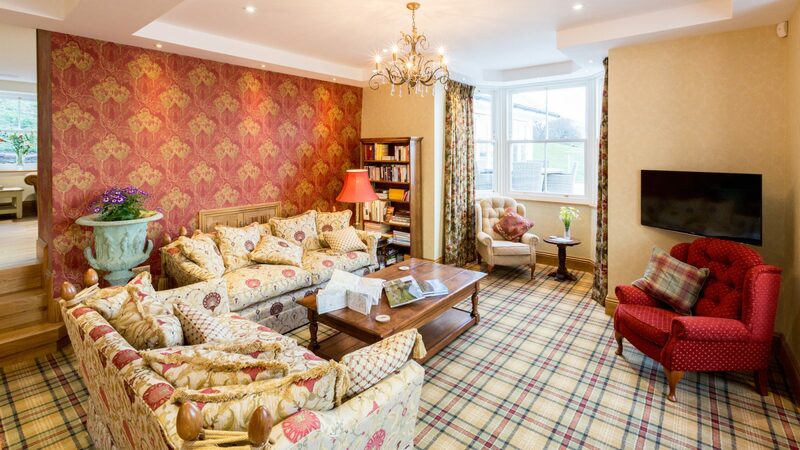 Break away with a book in the minstrel’s gallery or the snug. Open up the doors to the sunbeams and the sound of the lake water. Pop another log on the fire, turn the page, pour another glass. Heaven. Al-fresco drinking and dining doesn’t get any better than this. Out on the barbecue terrace, beneath the big skies and the sweeping fells, chargrilled chicken never tasted so good. Charge your glasses and toast the lake views. 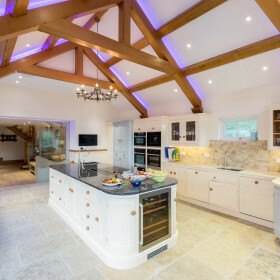 With two kitchens, catering’s a breeze. 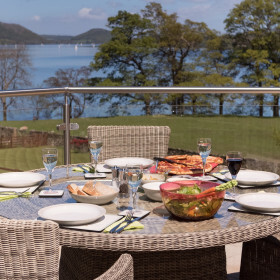 Ullswater House comes with electric ovens and induction hob, coffee machine, warming drawers, red and white wine temperature storage and instant-hot-water tap. On fine days, opening up the bifold doors to the terrace and letting the sunshine in feels like peeling back the layers of life. 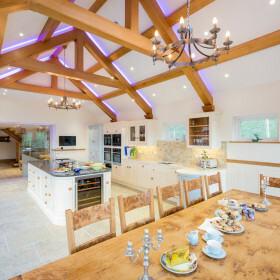 In Ullswater Barn, cooking is equally sleek and spectacular beneath the mood lighting, with electric oven and induction hob, kettle tap and waste disposal. But you might prefer a little pampering. Just say the word and we’ll send in the chefs and even deal with the dishes afterwards. Eating out? There’s roast or rib-eye at the friendly Fellbites Café. 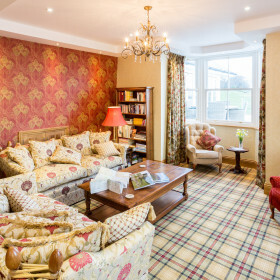 For fine dining, try the Glenridding Hotel’s Garden Room Restaurant or light snacks in Kilners Coffee House next door. 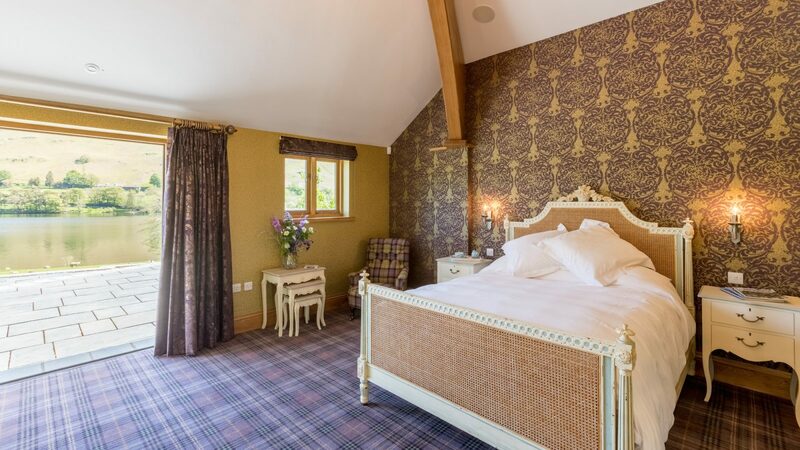 Or glam things up with the Michelin-starred Holbeck Ghyll in Windermere. 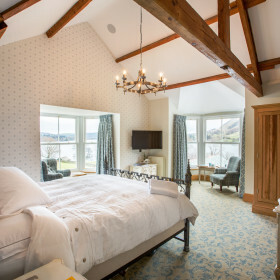 Ullswater Estate sleeps 20 in the lap of sumptuous luxury. 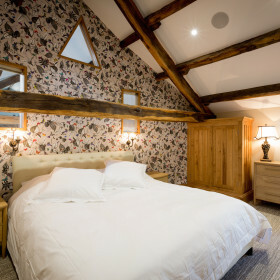 Both properties come with handcrafted beds, Vi-Spring mattresses and duck-down pillows. Surround-sound music, TVs and mood lighting bring the bedrooms alive. Bathroom floors are heated and Villeroy and Boch fittings are paired with monsoon and raindrop showers. 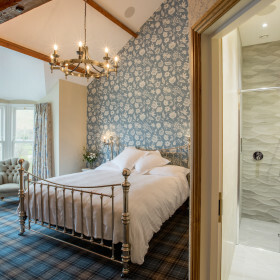 In Ullswater House, Fusedale is a stylish and elegant room with a lake view. Pikeawassa adds a raised designer bath and superking bed. 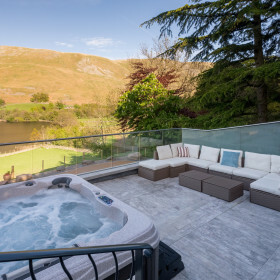 Martindale’s a wildlife-watcher’s haven, or you can bag Boredale for private spa access and balcony. Hallin is quaint and quirky with mountain views, while Bonscale overflows with opulence. 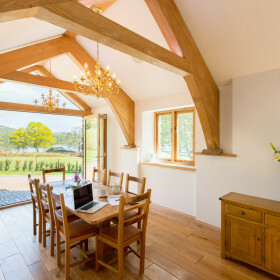 Ullswater Barn sleeps eight in four bedrooms. Cockpit is characterful with lake views and low beams. Loadpot laps up the lake views. Butterwick offers oak beams and arrow-slit windows. 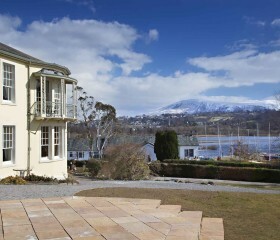 But the best could be last: Ravenhowe comes with sun-terrace doors that open wide onto the sweeping fells and calm waters. Yes, there really is a spa and wellness centre. And, if and when you tire of it, you can pop out onto the infinity terrace for a spot of yoga under the stars. Or while away some time in the hot tub. 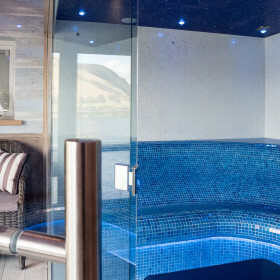 Don’t let the underwater mood lighting and the waterfall effect detract from the sweeping views of the lake and the fells. But of course, you might never emerge from the holistic laconium with aromatherapy option together with twinkling star lighting. Or you might not be able to tear yourself away from the bar. A light G&T before tea can be most agreeable. You can freshen up later with the stone monsoon facility. Out on the terrace, throw on a robe and slippers and relax with a book and some music on the outdoor seating. Here, tranquility reigns, as the lake water laps the shore and the Ullswater steamer turns for home. Life could be worse. 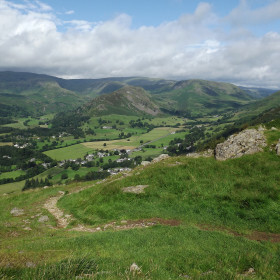 Take to the trails; bike, hike or hack the fells; walk the ridges. 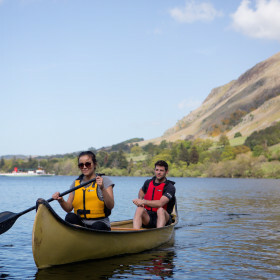 Canoe the lake, swim al-fresco at Askham, picnic by the Eden, or potter the shops at Penrith. Make pals with the Alpacas at Stainton. Fish the lakes and streams, climb up to Aira Force and on to Gowbarrow Fell. Breathe the clean air. Plan your next trip.